Driving home alongside West Quebec’s Gatineau River one April afternoon, Ellen McGinn spots a parked car that looks like it might belong to her friend, Lucy Stockman. Arriving home, Ellen receives a phone call from Lucy’s common-law partner: Lucy has disappeared. Led by a series of disturbing visions, Ellen embarks on a nerve-wracking search that soon becomes a determined quest for the truth beyond the stereotypical appearances of her friend’s risky relationship with an ex-convict. Terrified for her own life and getting in over her head with a compelling police detective, Ellen reaches a deeper than bargained for understanding of Lucy’s dark journey—and her own. 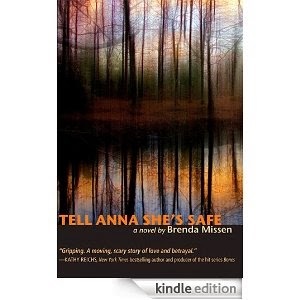 Tell Anna She’s Safe was inspired by and based on the life of Louise Ellis, an Ottawa freelance writer who disappeared in 1995. The author, Brenda Missen, was a friend and colleague of Louise, and was the person who found Louise’s car when she first went missing. This excerpt is part of a longer scene that shifts back and forth between Lucy’s visit to Tim at a medium-security prison and her arrival back home to her current boyfriend, Curtis, in Ottawa. I had received permission from Corrections Canada to visit Warkworth Institution so that my description of Lucy’s visits there would be authentic. I had never visited a prison before and the whole experience was so etched in my brain I think it fuelled and sharpened the writing, especially when I had to write it from the perspective of a woman so filled with fears and anxieties. This first visit to Tim (after many letters and phone calls) is a pivotal moment for Lucy, when she makes the decision to truly leave behind her familiar world and pursue a relationship with this man whom she had met after he had given testimony in an important Supreme Court case. I got the idea to shift back and forth between the prison visit and her own home, using word association to provide a link between the two settings. I think the quick alternating of scenes, and the contrasts between them, gets across the shift as it is happening inside her—and shows how it is, for her, a positive shift. It was a very satisfying scene to write. The word associations and contrasts/similarities in emotions that provide the links between the two settings came very naturally, and it’s a technique I’m now using on a much larger scale in my current memoir. As she stood, dazed and exhausted, the screen door swung open. She had to step out of the way. She stepped in through the door. She handed over her purse. If body searches had been legal, he would have found it was her heart, not her frontal lobe, that was gone. She was amazed at how detached she felt from him. And not amazed at all. They sat down at the kitchen table. Curtis poured her a glass of wine. She was too tired to appreciate the gesture. She was too tired to drink it. She was overcome by the wearying sensation of having driven not just hundreds, but seemingly thousands, of kilometres. What was she doing here? Who was this man? He sat before her, shoulders slightly slumped, avoiding her eyes. Where were the presence and confidence he had exuded in the courtroom? Where was the familiarity she had felt in meeting him there and in their letters and phone conversations? She was sitting before a prison inmate who, when he had lived in her world, had committed countless acts of fraud—and one act of manslaughter. What was she doing? She was starting to feel dizzy. The smoke seemed to have filled not just her lungs but her entire insides. It was choking her. She was going to faint. She just needed to signal to one of the guards. She could get up and walk out without saying a word. They could pretend she had never come. She could go back to her safe, familiar world and he could stay here, in his. In her mind, she was already summoning the guard, mentally raising her arm as if he were a waiter. Tim cleared his throat. “Your drive here,” he began. Her horror magnified. In her mind she was tugging furiously on the guard’s sleeve, to get her out of there before Tim spoke. She was terrified he was going to say something mundane about the drive, the weather. That he wouldn’t be who she thought he was. That she’d made a massive mistake. Her head began to spin. Nausea overwhelmed her. She was going to throw up. The words entered her head like a peacekeeping troupe and made it stop spinning. The nausea vanished. Her vision cleared. It was Tim. Thank God he was still not looking at her, had not seen her face; it was shyness, not social backwardness. It was respect. It was nothing she’d ever experienced before. “I’m kind of overwhelmed by you sitting here in front of me.” Tim gave a small, embarrassed laugh and then he met her eyes. The guard she had summoned in her mind stood waiting. She handed him all her doubts, all her skepticism, all her fears—shitloads of fear. And then she sent him away. He was looking at her. She was supposed to be talking, spilling out the experience. She didn’t want to share this. She didn’t want it exposed to his cynical paintbrush, his layering of ridicule and mockery. Thinly disguised jealousy. She met Curtis’s eyes. And for the first time she saw the pain in them.